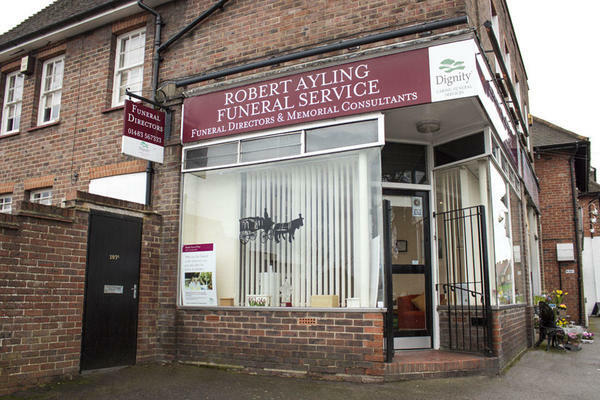 Robert Ayling Funeral Directors in Guildford is honoured to serve the Surrey community, providing expertise and compassion in times of need. We can arrange a special funeral for your loved one. Regardless of faith or culture, we will ensure that your farewell is a dignified occasion in keeping with your wishes. Whether it is a traditional ceremony or something a little more alternative, such as a woodland or green burial, you can place your trust in our dedicated team to make the appropriate arrangements. We are privileged to be able to help and support local families in the way that we do, providing assistance during difficult times. Our funeral home is located on the Aldershot Road, at the corner with Southway, allowing us to offer our high standard of funeral care to all of Guildford. We are also accessible to families living in our neighbouring Surrey communities, such as Farncombe, Fetcham and Worplesdon. There is a private chapel of rest available if you want to spend time with your loved one prior to the funeral. Our team is here for you and available to talk to at any hour. To arrange a funeral for your loved one, call us today. Call us today on 01483 567333 to talk through your personal requirements. At Robert Ayling Funeral Directors, we understand how special life is with those that you love. For us, every funeral is unique and personal. We have a service to fulfil every wish, with every detail carried out with the same uncompromising quality of care. From a traditional service, to a colourful woodland burial, your options are limitless with our Full Service Funeral. If you have a little more flexibility when it comes to arrangements, then we can provide a Simple Funeral for a lower cost. For advice on where to park, please give us a call. We are on the corner of a parade of shops, at the opposite end to the Co-op. Our staff are available 24 hours a day on 01483 567333 if you require our services outside of these hours.